After the primer, I flipped the boat right side up again and found that at first glance the topside looked pretty good. Upon closer inspection though I realized some substantial surgery was in order. The first obvious problem was that the thwart pillars on either side and the forward one had some hardware store steel (rusty) brackets screwed into the side. 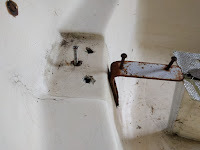 Of course they were junk and it also indicated that whatever backing plates the boat had on top of the pillars when the boat was built were either gone or just rotten. What that meant was that I had to get behind them and to do so I needed several access ports. I settled on two 4" ports just forward of the port and starboard thwart pillars and a 6" port between the mast step and the splash coaming. For good measure I also decided on a 6" port about foot forward of the stern in anticipation that the rudder mount is bad. After measuring everything out, I cut all four holes with my roto-zip with hole cutting attachment. 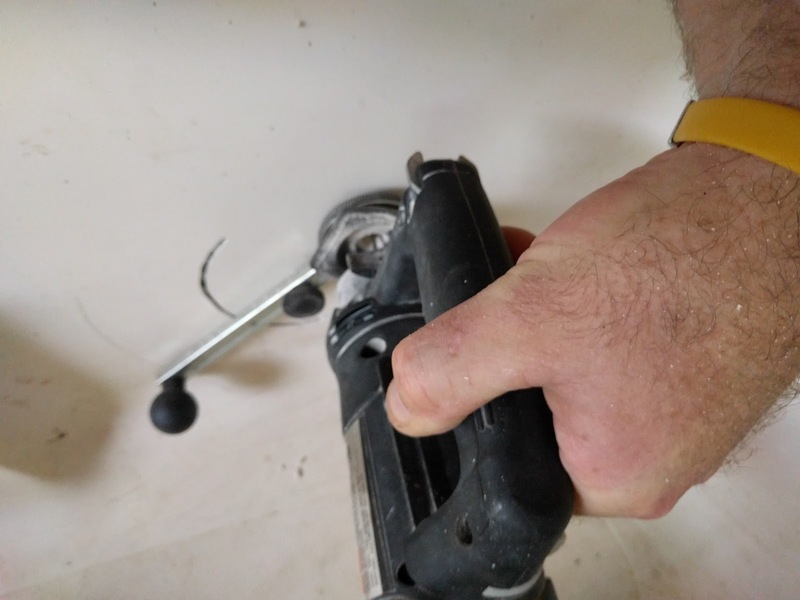 I'm not a huge fan of roto-zip, but the hole saw attachment is the exception. 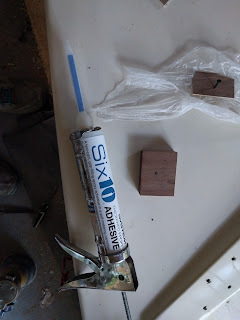 The two 4" holes gave me good access to the soft, damp wood and piss poor attempt at encapsulation. Nice try AMF; I'm guessing my boat was built on a Friday at 4:30 and they needed to get it to paint to make their quota. Anyway, I pretty much expected that, but when I opened up the cutout 6" port just aft of the mast step, I was faced with wet foam. Lots of it. Nasty, smelly stuff that just had to go. I spent a good hour or so with a small hand saw cutting the blocks into small enough pieces to remove from the hole. I ended up with 2 trash bags and about 20 pounds of old foam in there. 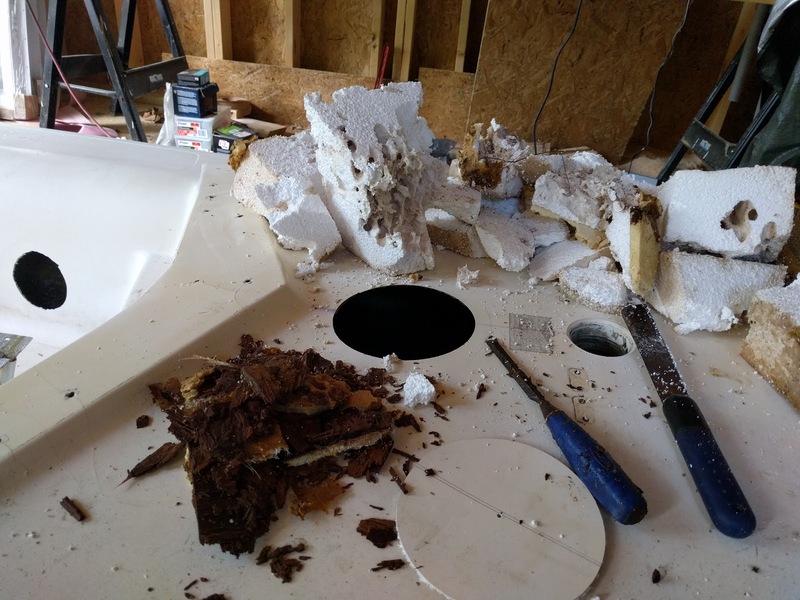 After letting it dry out overnight, I was able to get to the backing plate for the splash coaming and the forward thwart pillar and once again found wet mushy plywood with a thin layer of fiberglass over it that I could crumble with my fingers. I ground out all the old backing plates and found that one actually had an aluminum backing plate in addition to the plywood, but couldn't find any others. Once satisfied, I cut out Sapelle blocks for the thwart pillar backers and 1/2" marine plywood for the splash coaming backers. I gave it all a coating of epoxy before glassing them all in with West System 610 epoxy (temporary screws holding them in place. 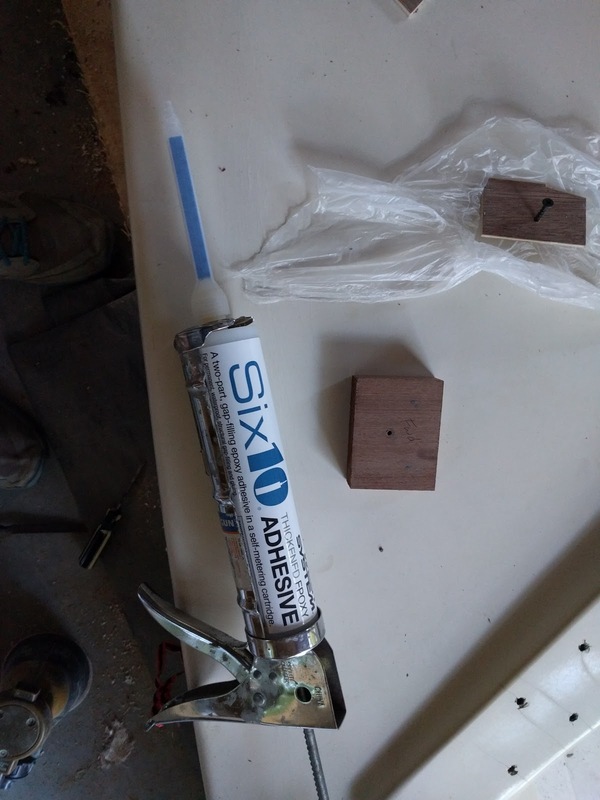 610 is perfect for this type of application because it gives you a consistent structural filling compound with the squeeze of a caulking gun.